This is a painting I'm doing for one of my classes, as part of a themed show on "change". 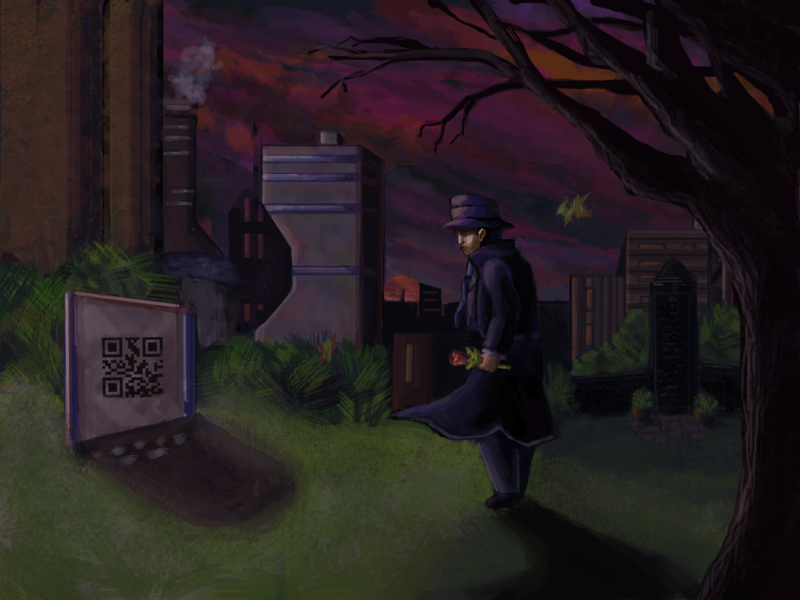 The character is visiting his wife's grave. Relatively small painting that will be shown with some pixel pieces and sketches to convey the idea of "evolution". Wanted to keep the 4:3 ratio and the iconography simple. 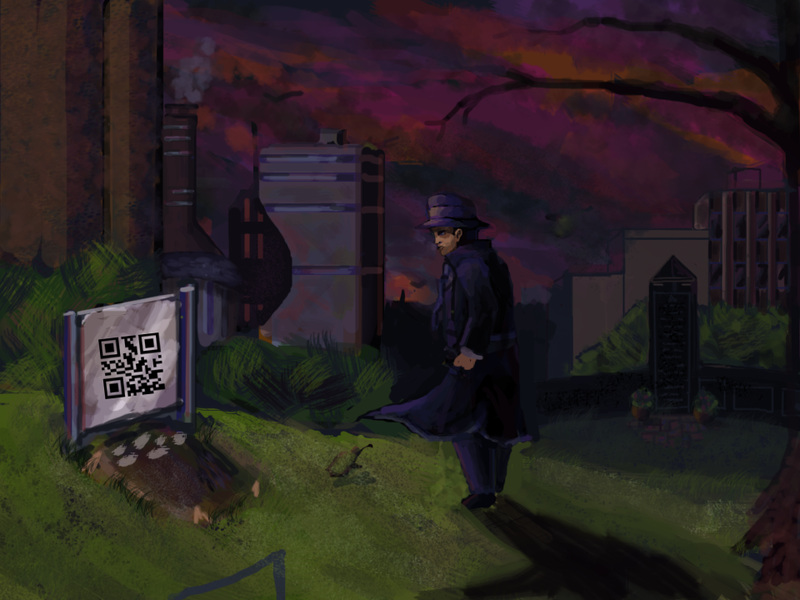 The graves are ambiguous, because it's the future, and the information for each grave is stored via QR code, that you would scan to project a hologram of the deceased, like a small biography about them. 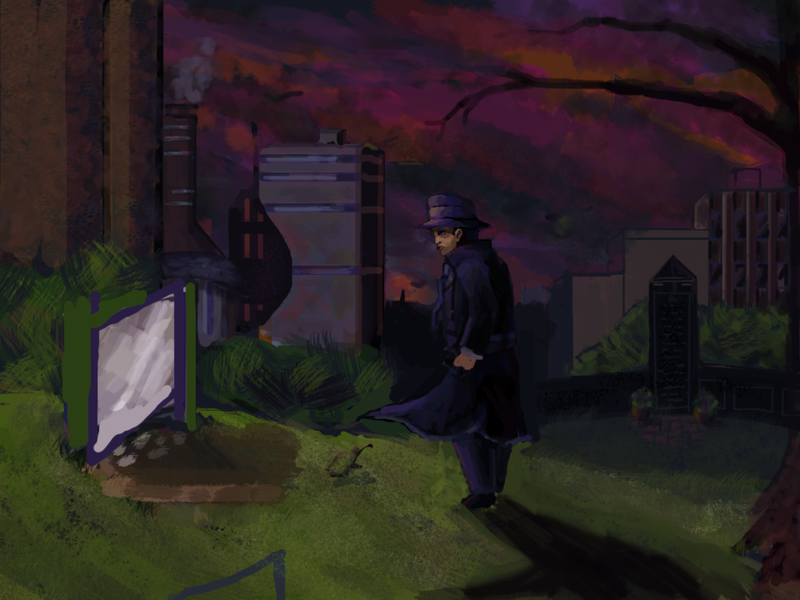 Thinking about pushing the atmospheric perspective, and maybe using the left-hand building to help frame the image. 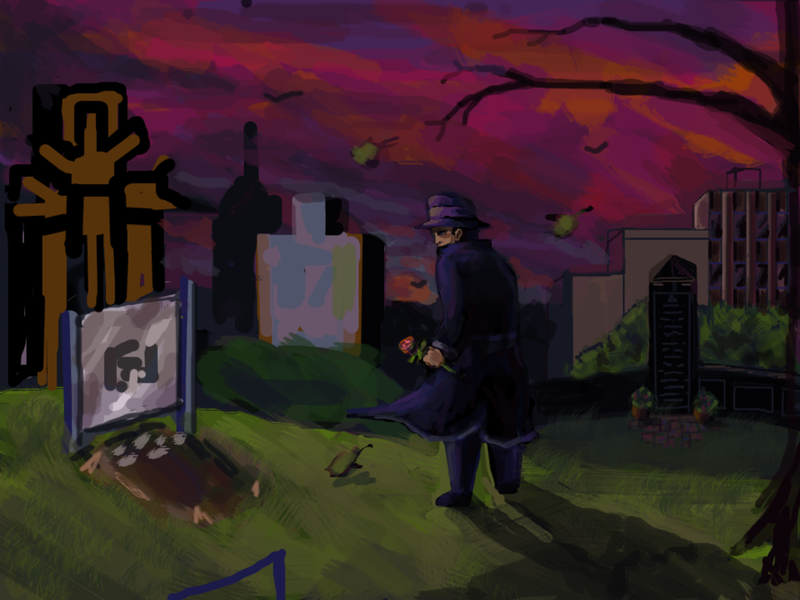 It's rough, but I guess I'm looking for general feedback, highlighting composition/atmosphere/color, anatomy and perspective. Btw is it punishable by death that I'm using default photo shop brushes for this? I know you can make your own, but any suggestions on where to start building up a collection? 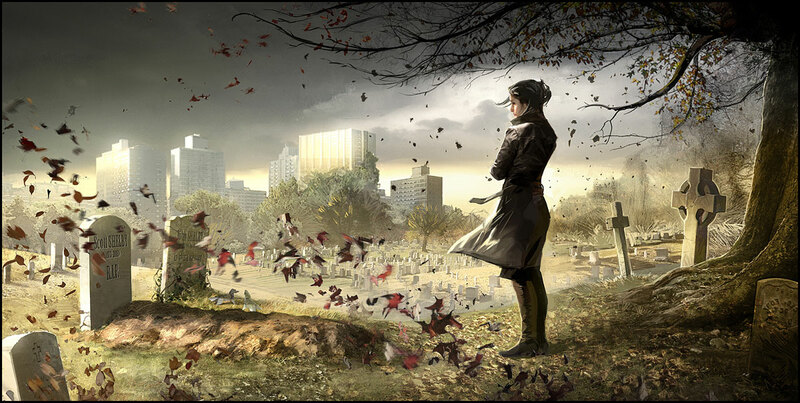 Awfully colorful for a scene focused on mourning/death. Why not a nice bold desaturated duotone effect - ramp with a hue shift? 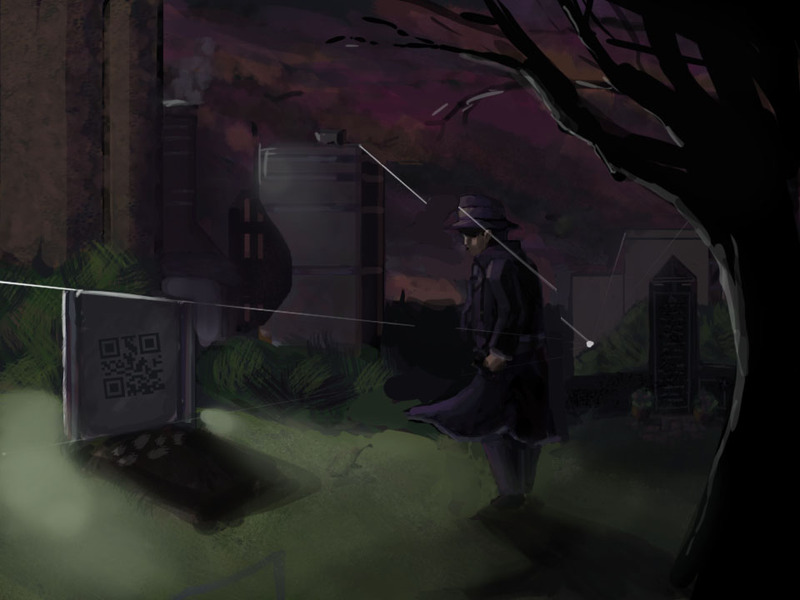 I find it odd that he's standing where he is - like he just now noticed the grave and he's turning to look at it. I think it should be his complete focus. I recommend a much stronger fg/bg separation. Kinda like in the platformer games we're always critiquing here - make the foreground stand out, and maybe blur/obscure the background in a depressing, hazy fog. Come on, futurify those bg buildings better! I'm also trying to build a library of PS brushes I like. Came across this the other day. Haven't had a chance to do anything serious with it yet. You might try it out. Other than that, have you tried PS CS5's media brushes yet? I would encourage you to revisit the perspective of this image, there are a lot of issues with it. There is no shame in using default brushes; in fact 90 percent of the painting can be done with these brushes, and probably should. But feel the same issue still persists. Also, thanks for posting those brushes, having a lot of fun with them. currently you have multiple vanishing points and horizon lines in a pretty standard 1 point perspective set up. The tree could better be used as a framing device, I believe. And I moved the guy a bit to the right for rule of thirds-ness. This is optional. keep your light consistent with the grave. It's completely in shadow so I lightened the area around it to improve it as a focal point. Perspective and composition are things I'm trying to get better at, hence paintings like this. Cheers. Edit: Just got a drawing tablet, so it will be interesting to experiment with this and see how it changes the dynamic. Yes! That looks much better already. Have you been doing this with a mouse the entire time so far? If so the drawing tablet will be a HUGE improvement. Also, any justification for the very saturated colors in a night scene? One thing you can do is desaturate the picture, and selectively bring up the saturation in the focal point. Man the tablet takes a lot of getting used to, I'm quick to default to my safety, the mouse, in which pixel art has toned my dexterity. It'll take some training, but will def help in the long run. For the sake of time, yeah the majority of this was painted with mouse, with a few trial strokes here and there with the pen. It's intuos 5, smallest size. Anyways as for the painting itself I think it's come along way while maintaining a consistent concept. I like how it's turned out. It needs to be done pretty much asap so last minute crits and fixes welcome. The high saturated color is because it's technically a sundown not straight night, and I like the type of misty crazy color skies that you see in really polluted cities, and wanted to emphasize that, as well as purple being a color motif for the character and the city in general. 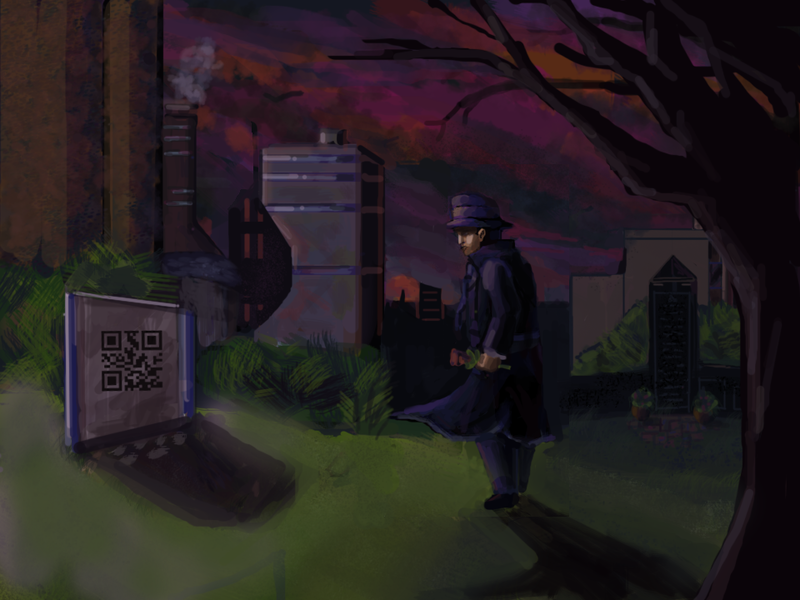 Also, I'm supposed to print this on photo paper, but I painted in RBG and think it needs to be CMYK for print. If I convert now will there be any significant color loss/changes? The tablet feels slippery right? When you draw on paper there is much more friction. Get a really cheap, thin, fabric top mouse pad. You can find one at Office Depot or whatever for a couple bucks. Throw it on top of your tablet. Draw with the pen on the surface of the mouse pad. The pad will add more friction, slowing down the pen. This will give you more subtle control and feel more familiar. You could even throw a sheet of paper on top for a more classic friction. But the mouse pad is nice because of the pad on the bottom. I also use the mouse for 99% of the art I do, pixels and vectors. However tablets are really fun for Photoshop painting. Man that is a brilliant idea. I got an extra mouse pad, and it makes such a difference. I'm considering this finished for now, as it served it's purpose, I printed it for the gallery. I'll post a pic of what it looks like printed though it will hardly do it justice. Open for further reduxes as well.